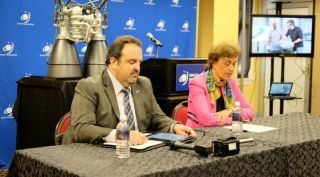 Steve Cook, left, and Aerojet Rocketyne's Julie Van Kleeck brief reporters on the AR-1 engine at the Space Symposium in Colorado Springs in April. Updated at 4:30 p.m. Eastern. WASHINGTON — The transition team for U.S. President-elect Donald Trump added six more people to the NASA landing team Friday, representing a range of viewpoints on topics such as commercial spaceflight and development of heavy-lift launch vehicles. Among the new landing team members is Steve Cook, who was in charge of the Ares 1 and Ares 5 rocket programs at NASA's Marshall Space Flight Center in Huntsville, Alabama, until leaving the agency in 2009 for Huntsville-based Dynetics. The Ares program was canceled under President Barack Obama, but elements of both rockets were folded into NASA's design for the Space Launch System heavy-lift rocket the agency is building to launch the Orion crew vehicle on deep space missions. Offering a different perspective on those issues is Greg Autry, an assistant professor of entrepreneurship at the University of Southern California. Autry has written extensively in support of commercial spaceflight despite setbacks like the Falcon 9 pad explosion in September. Autry, in an October op-ed that outlines space policy recommendations for the next administration, took a harder line on the SLS. "We will discontinue spending on Space Launch System (SLS), a giant government rocket, lacking both innovation and a mission," he wrote. "While SLS has consumed the largest single piece of NASA's budget for years, private sector operators like SpaceX and Blue Origin have leapfrogged it with more efficient, reusable boosters." A third new landing team member, Jack Burns, is a professor at the University of Colorado and senior vice president of the American Astronomical Society. He has been an advocate for lunar exploration, serving as director of the Lunar University Network for Astrophysics Research (LUNAR), a network of universities and NASA centers that studied the use of the moon to support space science research. He was also the chair of the NASA Advisory Council's science committee in 2009 and 2010. The NASA landing team is led by Chris Shank, who worked for House Science Committee Chairman Lamar Smith (R-Texas) until last week. Shank worked for NASA from 2005 to 2009, during the tenure of administrator Mike Griffin. Shank, formally named to the landing team Nov. 29, has already been meeting with NASA officials about transition issues. "We've had a great couple of days with Chris," said NASA Associate Administrator Robert Lightfoot at a Dec. 9 Space Transportation Association luncheon here. "He's just starting the meetings with us, mostly at this point catching up on where we are on items. He's asking a lot of questions and we're working with him pretty well."